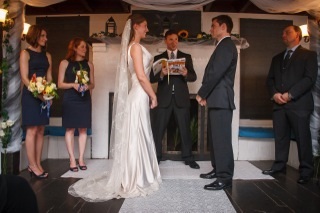 Recently, my best friends Alex and Kelly asked me to officiate their wedding. They’d been together 17 years, and it was a tremendous honor to be the one to officially help them tie the knot. After getting my one-day officiant certificate from the state, I had to go about planning the wedding. Since we all spend most weekends grilling on their roof-top deck in Boston, I figured the unifying religion was the religion of barbecue, and being a big fan of yours, it occurred to me the most appropriate bible to officiate from was none other than the Barbecue Bible! So I glued a bible tassel into the book and taped my speech and their vows into their book, starting with the “High on the Hog” chapter. Almost everyone noticed the Bible and I got a ton of compliments for doing that. 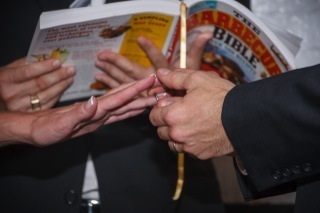 But unbeknownst to me, the bride and groom had joked amongst each other about asking me to officiate from the Barbecue Bible! They opted not to mention this to me because they wanted me to have completely free reign to run the ceremony as I saw fit. But it’s certainly a telling coincidence that we all had this in mind independently!